The GRAS 45CB Acoustic Test Fixture is designed and specified to comply with the ANSI/ASA S12.42 standard. 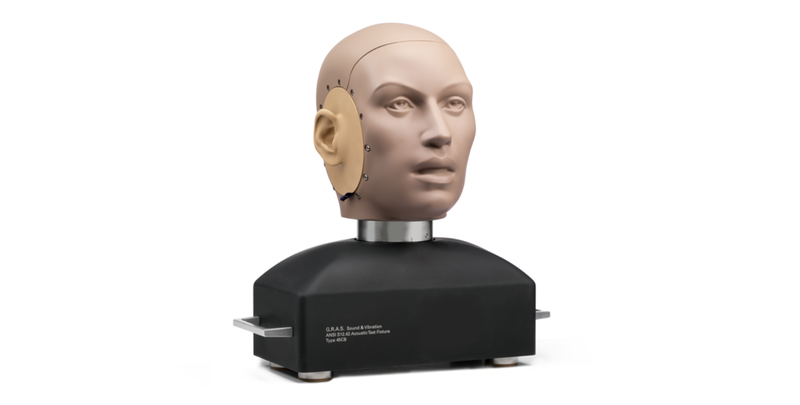 With this test fixture, you can test all types of hearing-protectors in the most realistic way - both in the acoustic lab and in the field. Compliance with ANSI/ASA S12.42 assures technicians, decision makers, and authorities of repeatable and transparent data when developing and verifying hearing protectors. The 45CB’s robust design is ideally suited for binaural testing of active and passive earplugs, as well as circumaural hearing protectors. It is designed for portability, which gives you flexibility for your testing setups. The large base plates of the pinna simulators can accommodate all types of circumaural ear muffs. The silicone-rubber lining of the plates ensures leakage-free mounting, as well as higher repeatability and reliability. All the silicone-rubber parts of the 45CB can be heated to body temperature to give the most realistic testing of in-situ performance of ear-plugs. The heating unit of the system is set by default to 37 degrees Celsius. The modified IEC 60318-4 ear simulators have a 14-mm long ear canal extension is designed to let you also test all types of ear plugs. The silicone-rubber lining of the extension enables leakage-free mounting of both foam plugs and customized molded types. The 45CB has a self insertion-loss better than 65 dB, which means you are actually measuring the insertion loss of your hearing protector and not the fixture. Calibration is easy with the 45CB. You only need a pistonphone to quickly verify the full measurement chain within minutes and not waste valuable time and resources on a non-calibrated setup. To transport and store the acoustic test fixture, a dedicated case, with option for wheels, is included. The 45CB is delivered in three different configurations with different ear simulators. The 45CB is configured with RA0045-S7 Ear Simulators which are equipped with 40BP 1/4" ext. pol. pressure microphones. Its sensitivity is 1.5 mV and the dynamic range is from 50 dB(A) to 169 dB. 45CB-S1 is a high-sensitive version. It is configured with an RA0045-S8 Ear Simulator which are equipped with a 40AG 1/2" ext. pol. pressure microphones. Its sensitivity is 12.5 mV and the dynamic range is from 27 dB(A) to 164 dB. 45CB-S2 is a high-pressure version. It is configured with RA0045-S9 Ear Simulators which are equipped with a 40BH 1/4" ext. pol. pressure microphones. Its sensitivity is 0.4 mV and the dynamic range is from 62 dB(A) to 193 dB. The GRAS 45CB Acoustic Test Fixture according to ANSI S12.42 is developed for testing of both ear-muffs and ear-plugs. For testing ear-muffs, special attention was put on those types that are integrated in helmets. The result is head dimensions that reflect the average user of today's available head gear. For testing ear-plugs, the focus was put on the mounting repeatability and damping as function of the body temperature. The result is a longer, silicone-lined ear-canal that can be heated to body temperature. Today's use of hearing protectors ranges from construction sites to heavy industries, to civil as well as military aviation and to surveillance activities and combat scenes. For that reason, the 45CB is designed for tests at very high levels without compromising its self-insertion loss or losing data. Because the 45CB is built to comply with, or exceed, the ANSI S12.42 standard, it can cope with demands such as testing in the field and withstanding high pressure levels like explosions. It can help manufacturers improve the quality of their products to meet the markets’ and the standards’ growing needs for design, quality assurance, and verified compliance to stricter regulations. The pinnae for the 45CB are the same standardized KEMAR pinnae, but with a large base plate to comply with the requirements of the ANSI S12.42 for correct circumaural testing. This large base plate reduces or eliminates the risk of leakage. The ear extension has been extended into a 14 mm long and 7.5 mm wide ear canal with a heatable silicone rubber lining. The ear extension can accomodate all sizes of ear plugs, including the deep-insert type. The removable ear simulators are based on the IEC 60318-4 standard, but are modified with an extra back volume to support the high self insertion loss of the 45CB. The control unit in the base of the 45CB is for setting and monitoring the temperature during tests. The control unit heats the silicone rubber lining of the ear canal extension to body temperature for realistic measurements of the properties and damping effects of ear plugs. The 45CB includes two plugs for measuring self insertion loss in a closed ear. We recommend calibration prior to each use to ensure the accuracy of your measurements. The design of the 45CB makes this task very easy. The 42AP Intelligent Pistonphone or 42AA Pistonphone are ideally suited for this task. The 45CB requires a 200 V polarization voltage for its externally polarized microphones. For daily verification and check of your measurement setup, we recommend using a calibrator like GRAS 42AG Multifunction Sound Level Calibrator. For proper sensitivity calibration, we recommend using a pistonphone like GRAS 42AP Intelligent Pistonphone. GRAS offers 5 years warranty against defective materials and workmanship. If you accidentally damage the diaphragm on a GRAS microphone, we can—in most cases—replace it at a very reasonable cost and with a short turn-around time. This not only protects your investment, but also pleases your quality assurance department because you don’t have to worry about new serial numbers, etc. Before leaving the factory, all GRAS microphones are calibrated in a controlled laboratory environment using traceable calibration equipment. Depending on the use, measurement environment, and internal quality control programs, we recommend recalibrating the microphone at least once a year. The self insertion loss is the same for all three configurations.